As if getting rid of zits isn’t stressful enough, they often leave behind ugly dark spots that seem to take forever to go away. And the emphasis on barely-there makeup and polished complexions doesn’t make things at all easier. What do you say? Time, then, to bring out these tried and tested recipes that bust post-acne marks, erase skin discoloration (including age spots and sun-related hyper-pigmentation) and leave skin looking gorgeously flawless! This 2-in-1 mask and scrub delivers a powerful dose of skin lightening tannins, enzymes and Vitamin C to help even out skin tone and erase acne marks. 1. Puree 1 apple (that’s been peeled and cored) in a food processor. 2. Add the rind of 1/2 lemon and 2 tablespoons powdered milk or soy milk; blend until you have a smooth paste. 3. Apply all over the face, avoiding eye area. Leave for 15 minutes, then rinse off. This can be store in the refrigerator for up to 1 week. Apple cider vinegar not only provides naturally exfoliating AHAs, namely malic acid, but also a host of trace minerals and vitamins. Onion juice contains a whitening antioxidant called quercetin, which helps even out skin discolorations, spots, post-acne marks and minor scarring. Vitamin E helps heal scar tissue, while nourishing the skin. 1. Peel 1 onion and either blend it with a stick blender or juice with a juicer. 2. Combine with 3 tablespoons apple cider vinegar in a glass bowl. 3. Gradually add 2 teaspoons of corn flour until you reach the consistency of a smooth paste. 4. Add 10 drops of Vitamin E oil and mix everything well. 5. Apply over cleansed face, avoiding eye area. Leave on for half an hour, then rinse. You can also use this mask overnight on troubled spots. Store upto 1 month in a glass container in a cool, clean place. Lemons are gentle skin whiteners, brighteners and exfoliating agents with antibacterial properties. Use this mask twice a week (not more) for best results. 1. Combine 2 tablespoons honey, the juice of 1/4 lemon and 1 tablespoon fine sea salt or fine brown sugar in a glass jar; mix well. 2. Apply the mixture on clean skin and gently massage using circular movements. 3. Leave to penetrate for 5 minutes, then rinse off with tepid water. Store chilled in a glass container for up to 2 weeks. Potatoes are rich in whitening enzymes, as well as vitamin C, which helps lighten the complexion. Yogurt contains mildly exfoliating lactic acid. 1. Combine the juice of 1 raw potato, 1 tablespoon almond meal, 1 teaspoon olive oil and 3 tablespoons yogurt in a glass bowl; mix well. 2. Apply a generous layer to cleansed skin on your face, neck, chest and hands. Leave for 20 minutes and rinse off with tepid water. This mask is best used on the day of preparation itself. Do you suffer from post-acne marks? What’s your secret get-flawless technique? « How to bust belly fat in 10 minutes. At home. I have always suffered from bad acne! Even now that I’m in my 30s, it’s still a major issue for me. Thanks for these! I’m definitely going to give them a try! I’m so self-conscious about my scars. Hopefully these treatments help. Thanks for the tips.These are inexpensive and easy to do also. Can i request for a post on this topic? i shaved my legs and while doing so , i had accidentally nicked and the skin came off. Thus there is white patches of skin which had peeled off and it looks weird. So i wear only long skirts and have stopped shaving. Is there any remedies for this. thanks again for all your lovely tips and advice and wishing you a happy rollicking 2016 !!! Great blog! The remedies on this article are easy to obtain at home. I use lemon peel to remove acne scars. 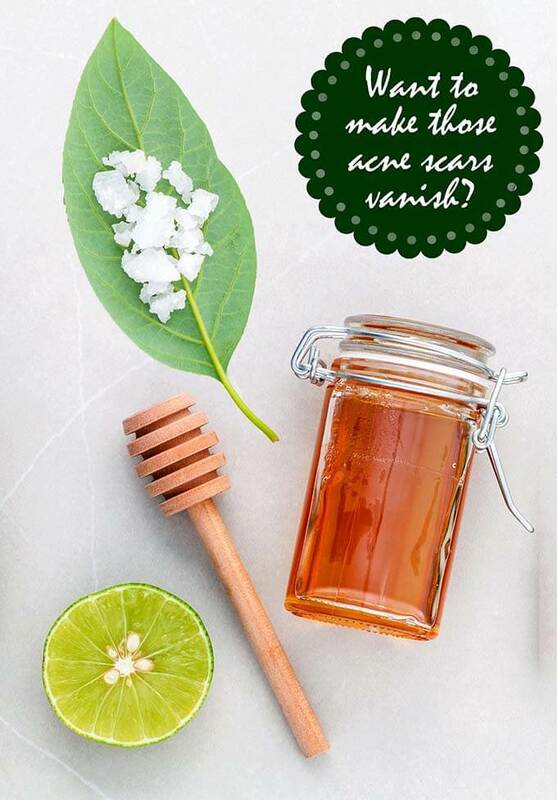 It works as a mild exfoliant to help fade the scar tissue layer by layer. Thanks for sharing.